Lively White from the French Alps! Spring is almost here and the warm weather is approaching. In fact, here in Florida we are already feeling the upper 80s temperatures one hopes to not experience until Summer. The best cure for that is to start opening some lively whites! 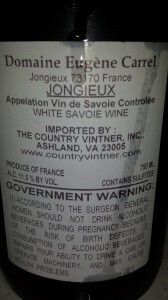 So today I cracked open a 2011 Domaine Eugene Carrel Vin de Savoie-Jongieux. This wine is made from 100% Jacquère, which is a grape that makes up fifty percent of the vineyards in the region of Savoie in France. The wine is somewhat rare, for mountainous Savoie is better known for the tourists who spend most of their time on the slopes of the French Alps, not for their wine. What a shame that is! Although wines made from the Jacquère grape in this region are finding themselves on the shelves of wine stores in the U.S. a lot more often than even just a few years ago, they are still uncommon. 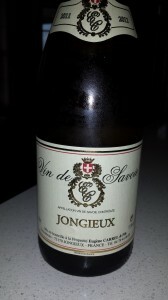 This particular bottling is named for the village of its provenance, Jongieux. The wine is aged sur-lie (or on its lees) until it is bottled, which gives it a fun effervescence! The color is light straw with a touch of a green hue. On the nose are citrus and white flowers. The palate provides light and crisp lemon, lime, green apple, pear and just a touch of spice. The finish is lean and has a bright minerality, but the fruit persists. The Domaine Eugene Carrel Vin de Savoie-Jongieux would pair beautifully with many foods, but I keep dreaming of having it with a local Savoie specialty, fondue with big chunks of hearty bread for dipping. If you’re a fan of Sauvignon Blanc, give Jacquère a try! You won’t be disappointed!